ARRA News Service: Broken Promise - Where Are The Jobs? Broken Promise - Where Are The Jobs? One hundred days ago, on May 5th, Vice President Joe Biden, as President Obama’s point man on the stimulus bill, submitted his first quarterly report on the progress of the $787 billion package. In the report, Biden claimed that since the bill’s passage in February “150,000 jobs have been created or saved,” though with little proof of that. In the press release accompanying the report, Biden wrote, “Looking ahead, an additional 600,000 jobs are expected to be created or saved under the Recovery Act in the next 100 days . . . .” So by today the stimulus bill was supposed to have created 750,000 jobs. Will the Obama administration be announcing that 750,000 jobs were saved or created today? There doesn’t seem to be any positive words on a bunch of new jobs from the White House or the press. The AP reports today, "The number of newly laid-off workers filing claims for unemployment benefits rose unexpectedly last week and retail sales disappointed in July. . . . The U.S. consumer remains very weak. The jobs situation, while slowly improving, is still dismal." Meanwhile, a new Gallup poll finds, "a dramatic increase in the percentage of U.S. workers who are personally concerned about losing their job. Now, 31% say they are worried about being laid off, up from 15% last year and easily the highest Gallup has found since the question was first asked in 1997." It doesn’t sound like the good news on jobs and economic recovery that Biden and the administration predicted 100 days ago is evident today. But perhaps an announcement is coming? 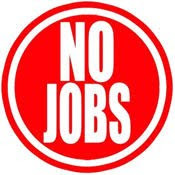 Tags: American jobs, broken promise, employment, Joe Biden, Obama administration, stimulus bill, unemployment To share or post to your site, click on "Post Link". Please mention / link to the ARRA News Service. Thanks! Exactly...and there's no way to accurately track the number of people who are still unemployed but aren't eligible for unemployment anymore (because their six or nine months has expired). Where are all of the "green" jobs the stimulus was supposed to create? And now the health care companies are laying off workers in preparation for "health care reform." Surely this is not the change the Obama voters were hoping for.